Boston Bartenders School has been training Boston area bartenders since 1989. 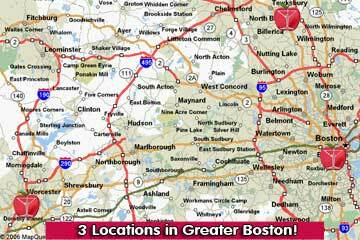 We operate three bartending schools in the greater Boston area. We have locations North of Boston in Tewksbury, downtown Boston in the Pledge of Allegiance Building and our newest location southwest of Boston in Worcester. All of our schools are licensed by the Massachusetts Department of Education. We believe bartending in Boston is a hands-on profession that cannot be learned by reading a book or watching a video. Our campuses are set up like an upscale hotel bar. Our students spend 75% of their time working behind one of our fully equipped bars under the supervision of our qualified instructors. Our bartending students will learn how to professionally prepare over 100 cocktails, bar opening and closing procedures, customer service, and basic beer and wine service. In addition, each graduate will receive responsible alcohol training and certification that is supplied by the National Restaurant Association. This certification is recognized nationally and is valid for life. Our Boston campus is located Downtown in the Historical Pledge of Allegiance Building where the pledge was actually written. We are located at 142 Berkeley Street on the 4th floor on the corner of Berkeley Street & Columbus Street near the Hard Rock Cafe. The building is very professional & offers many great amenities. Our Boston campus is very easily accessible from Interstate 93 & also the Massachusetts Turnpike. FROM the M.B.T.A.- take the Orange Line to the Back Bay stop and we are directly across the street. Just look for the Mitchell sign. From the Green Line just get off at Arlington and walk one street over to Berkeley Street. The Boston school is an absolute showcase and it is a must see when considering complete professional bartender training in New England. Our Boston location has 2 separate training facilities. Our main training bar is set up just like a real bar, with colored liquids replacing real alcohol. Our student center has booths and tables for our students convenience.We have audio-visual equipment and an online computer for our exclusive online bartender job placement program. We are very proud of our Boston campus. We invite you to personally visit our school so you can see with your own eyes the quality of our facility and the professionalism of our staff! Take the time to check out all of our pages and then TAKE THE NEXT STEP! Request more information on our Boston bartending school or call us today and we will show you how we can help you get started in your new bartending career in Boston.